When Jewish day school parents get together over a Shabbat meal, the talk often turns to the heavy financial burden they struggle with to meet the high cost of tuition. There is no silver bullet, they’ve learned, and that reality can hit hard. 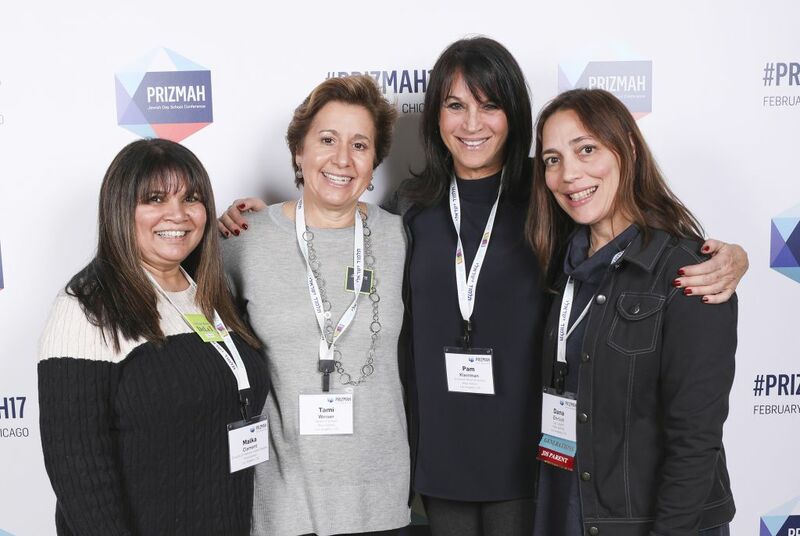 By contrast, when 1,100 Jewish day school educators gathered in Atlanta last week for the second biennial conference of Prizmah: The Center for Jewish Day Schools, the mood was upbeat. The theme was “Dare to Dream,” and the keynotes, panels, workshops and conversations focused — intentionally and passionately — on overcoming the prevailing pessimism of the day school community. The result was three days of deep engagement around innovation and collaboration. 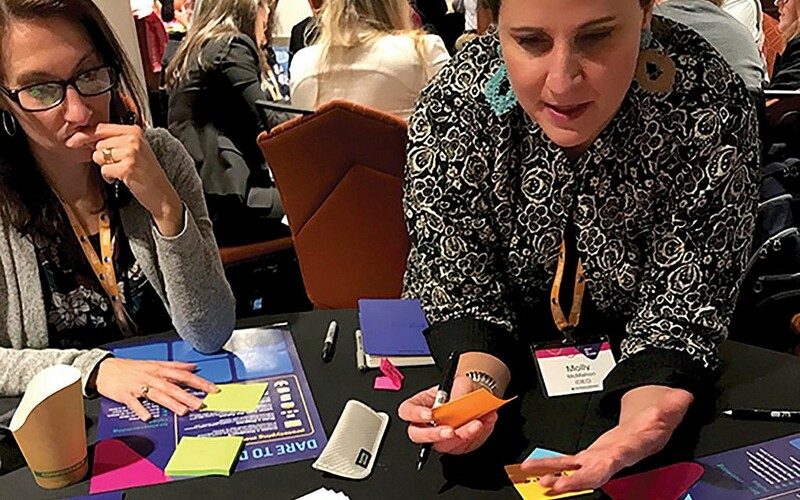 Outside experts like George Couros, an author and prominent educator in the area of innovative leadership, and Molly McMahon, director of The Teacher’s Guild, offered their audiences a variety of inspirational quotations about empathy and experimentation. But the participants seemed to most enjoy the opportunity to learn from each other — in sessions and informal settings, sharing successes and failures, from classroom techniques to fundraising strategies. At the outset of the conference, Paul Bernstein, the CEO of Prizmah — which grew out of a 2016 merger of five leading day school organizations representing different religious streams — paraphrased Dickens. He noted that “these are the best of times and the worst of times” for Jewish day schools. Some are facing declining enrollment and others, particularly in smaller communities, are closing down. Yet there are “rays of light” in terms of growth and advancement elsewhere. Indeed, some Orthodox day schools in the New York metropolitan area are growing dramatically. In addition, starting this fall, Beit Rabban, a small, non-denominational preschool-through-fifth-grade school on the Upper West Side, plans to add a grade a year through eighth grade. 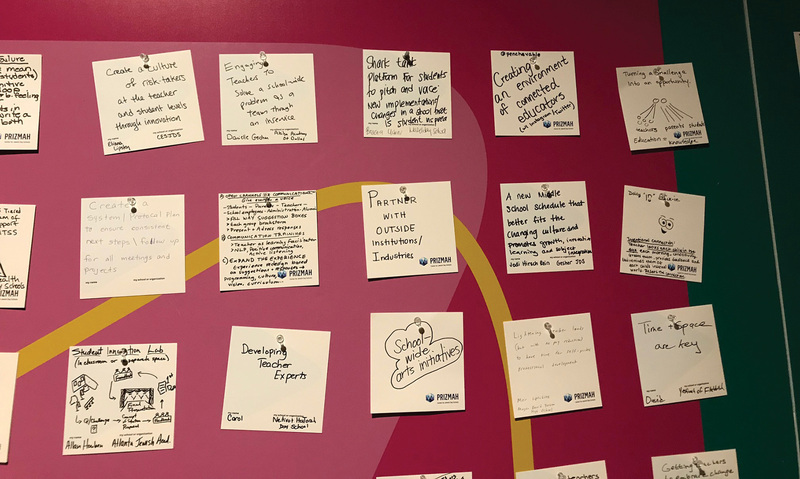 And The Idea School, the first fully immersive, project-based-learning Jewish high school in North America, opened last summer in Tenafly, N.J.
A portion of the “Dare To Dream” wall with scores of suggestions and proposals. 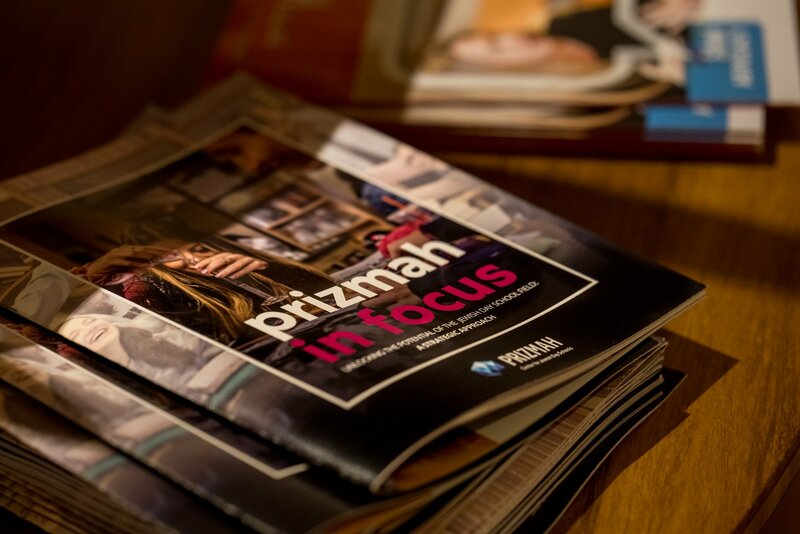 Bernstein referenced a new strategic plan for Prizmah, identifying four critical areas to best serve the more than 300 day schools that are active in its network: “deepen talent” by attracting and investing in first-rate teachers and other staff; “catalyze resources” by partnering with schools and communities “to generate $1 billion in new, sustainable revenue”; “accelerate innovation” by promoting growth and experimentation; and create a “network to learn” by enabling schools and communities to store and share information individually and collectively. To that end, Prizmah has just launched a Knowledge Center to house research and data online to be shared with the day school community. In an interview with The Jewish Week, Bernstein acknowledged “the vicious cycle” of fear and frustration in the community over rising tuition, sustainability issues and declining enrollment in smaller communities. But he emphasized the “virtuous cycle” of growth in appreciation for the values Jewish day schools promote. He noted recent trends in addressing high tuition costs, like the increase in blended learning schools, which have fewer teachers and more online, individualized education. Some of those schools seek to cap tuition at $10,000, about a quarter of the tuition the highest-priced day schools charge. A few communities are relying on philanthropic support and endowments to greatly reduce the cost of tuition. They want to see if there is a spike in enrollment. The overall number of students in the system “doesn’t tell the real story,” Bernstein said. “What really matters is the impact [of a day school education] and how students turn out in life.” Bernstein cited a “quality quotient” in noting the disproportionate number of day school students who as adults take on lay and professional leadership roles in the Jewish community. The participants were asked what makes day school a hard sell to parents and the community. The response: tuition costs came first, followed by competition with high-quality public schools, the lack of diversity in Jewish-only schools and trying to accommodate a wide range of Jewish practice in a single school. On the positive side, in addition to learning Jewish history and texts, the participants cited values associated with being a mensch. In decades past, most Jewish day schools had “the image of a fortress,” Pomson noted, “a protection from the world. Today,” he said, “it has changed from fortress to haven.” The day schools, he stressed, provide a healthy environment for growth, especially when parents worry about intense academic pressure, bullying and the influence of social media on their children. “It comes down to vision, value, core ideas and who’s leading the school,” said Pomson, who is co-authoring a book with Wertheimer on the state of Jewish day schools. Among the highlights of the conference was a moving tribute to the Avi Chai Foundation, which has contributed more than $350 million to day schools in its 35 years. It plans to “sunset” (close) at the end of this year. When one of the speakers asked those in the audience who have benefitted from Avi Chai’s programs to stand, almost everyone in the room did. A sweet moment at the closing session featured about a dozen fourth-graders from a local day school. They performed a song about Purim’s Queen Esther that they co-wrote at an hour-long workshop the day before with the band Distant Cousins, which performed at the conference. “Stand up for freedom, stand up for my people,” the children sang, and many in the audience rose to their feet. In other sessions, empowering students was offered up as a solution to a number of problems that crop up in schools. In one Orthodox high school for boys, students respond positively when allowed to meet one-on-one with the top administrator at the end of the year and offer suggestions for improvement. Similarly, at a session featuring several ELI Talks (the Jewish version of TED Talks), Rebecca Lurie, who heads a Solomon Schechter school in Boston, spoke of success in giving middle school students more of a role in planning and running tefillah (prayer services), which are often hampered by bored, chattering or inattentive students. 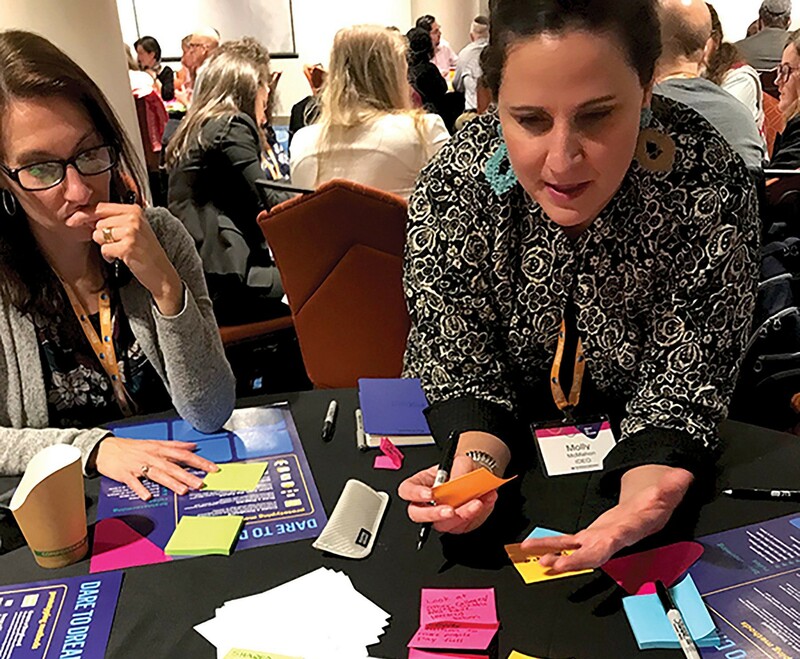 One afternoon was devoted to the Design Thinking approach to problem-solving, with the focus on empathy, creating change and thinking out of the box. I attended the three-hour session on financial stability; we were divided into groups of six or seven and challenged to come up with as many ideas as possible on how schools could raise and/or save money. We didn’t come up with a magic solution — surprise — but we appreciated the technique of making ourselves vulnerable, committing to each other, challenging our assumptions and not being afraid to strike out. In a sense, that’s what the Prizmah conference was all about. Bringing educators together, giving them the kind of appreciation they all too rarely receive in their home communities and letting them know there’s a national organization dedicated to offering support and ideas. It was about encouraging teachers and administrators to dig deeper and think bigger in finding ways to ensure the survival and growth of meaningful Jewish life in America in the face of an uncertain future.